Mr. Fox is on the watch! For other kigo related to INARI see below. 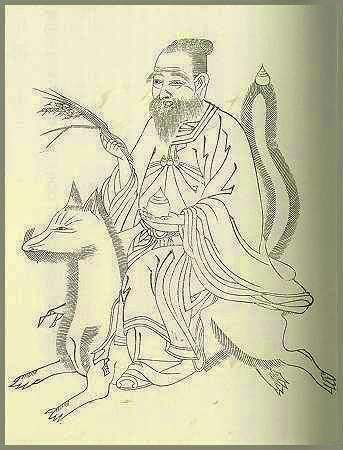 Inari　稲荷　the "Fox Deity", "Fox God". Inari's foxes, or kitsune, are pure white and act as their messengers. is the Japanese kami of foxes, of fertility, rice, tea and Sake, of agriculture and industry, of general prosperity and worldly success, and one of the principal kami of Shinto. In earlier Japan, Inari was also the patron of swordsmiths and merchants. 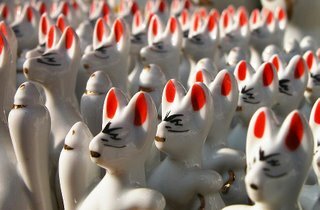 Represented as male, female, &/or androgynous, Inari is sometimes seen as a collective of three or five individual kami. Inari appears to have been worshipped since the founding of a shrine at Inari Mountain in 711 AD, although some scholars believe that worship started in the late 5th century. This tradidional Japanese festival occurs on the first day of the horse according to the Asian lunar calendar. The horse is the messenger of the Inari Deity.
. Inari fox on a horse . 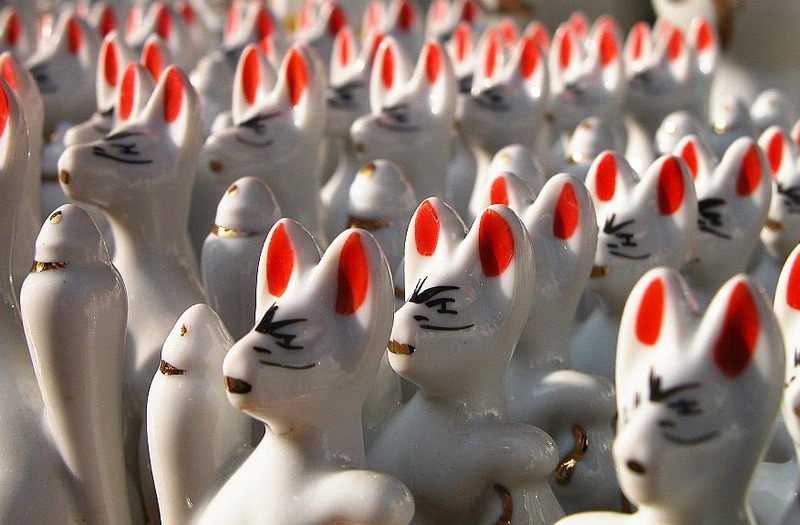 There are many Fox Shrines in Japan and this is the first large festival of the New Year. The great fox god shrine festival at Fushimi, Fushimi Inari in Kyoto is the most famous. Miketsu Kami 御食津神 / 三狐神 "Three Foxes Deity"
Ukanomitama is most commonly known as the kami Inari. From the medieval period, the kami was linked to popular combinatory kami such as Ugajin and Uka Benzaiten. 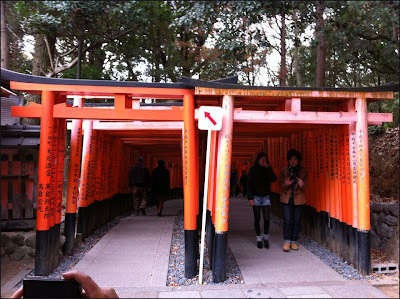 Ukanomitama is enshrined at Kyoto's Fushimi Inari Taisha and other Inari shrines throughout Japan. is the head shrine of Inari, located in Fushimi-ku, Kyoto, Japan. The shrine sits at the base of a mountain also named Inari, and includes trails up the mountain to many smaller shrines. 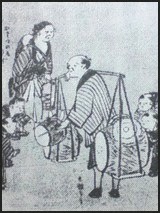 Merchants and manufacturers worship Inari for wealth. Donated torii lining footpaths are part of the scenic view. The shrine became the object of Imperial patronage during the early Heian period. 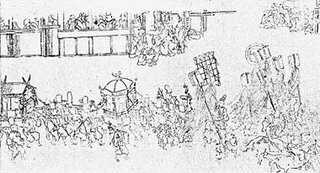 In 965, Emperor Murakami ordered that Imperial messengers were sent to report important events to the guardian kami of Japan. These heihaku were initially presented to 16 shrines including the Inari Shrine. The earliest structures were built in 711 on the Inariyama hill in southwestern Kyoto, but the shrine was re-located in 816 on the request of the monk Kūkai. The main shrine structure was built in 1499. At the bottom of the hill are the main gate (楼門, rōmon, "tower gate") and the main shrine (御本殿, go-honden). Behind them, in the middle of the mountain, the inner shrine (奥宮, okumiya) is reachable by a path lined with thousands of torii. Kodama-ike　こだま池 (木霊池) is a pond where people come when a relative was lost. You clap your hands and listen carefully. The direction of the kodama (echo) tells you where to look for the lost person. To the top of the mountain are tens of thousands of "honorable mounds" (御塚, o-tsuka) for private worship. The deity in residence is a god for health and medicine, there are sub-shrines around the area of Yakuriki Shrine are also visited for a long life, advance in medical technology and treatment, success in medical operation and for other specific health related problems. 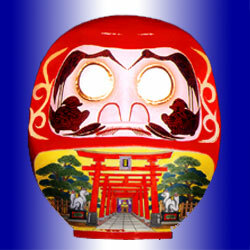 A deity for protecting the throat, 薬力大神 Yakuriki Ookami, is worshiped by people from performing arts such as singers and actors to perform daily on stage. On the way down are two "waterfalls,"
or rather places where water pours forth from an overhead trough so supplicants might stand beneath and test their faith while praying in the cold downpour, a religious austerity. The powerful Buddhist protector, Fudo Myo-o, is present in both spots. Another shrine which was founded by the immigrant clan Hata-uji (秦氏, Hata clan), Fushimi Inari Taisha (伏見稲荷大社). ..... Members of this clan also served as financial advisors to the Yamato Court for several centuries. Originally landing and settling in Izumo and the San'yō region, the Hata eventually settled in the areas of what are now Japan's most major cities. 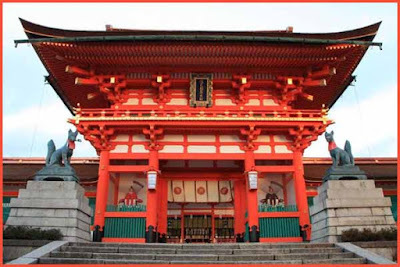 They are said to have aided in the establishment of Heian-kyō (modern-day Kyoto), and of many Shinto shrines and Buddhist temples, including Fushimi Inari Taisha, Matsunoo Taisha, and Kōryū-ji.
. Inari Myojin 稲荷明神 Honorable Inari Deity . INARI refers to the Fox as the divine messenger and thus a deity himself. KITSUNE refers to the fox as an animal. See below.
. Inari Daimyojin 稲荷大明神 .
. first day of the horse, hatsu uma, hatsu-uma 初午 .
. hatsu-uma ni kitsune no sorishi atama kana . On the first day of the horse during the Inari festival, children walked around drumming, and since there were so many Inari shrines in Edo, the vendors made good business. They sold all kinds of drums in various sizes and prices. They did not call out to announce their merchandise, but drummed on them, usually on the biggest one they carried, which was not for sale.
. The Big Drum (taiko, oodaiko 大鼓、太鼓、大太鼓）and other drums . At Fushimi Inari on January 12. With a special bow and arrow to ward off evil for the coming year. Arrows are shot into the four directions to purify the place. Finally the head priest shoots one big arrow. kamiya 神矢 "arrow of god"
. Hamaya, 破魔矢, arrow for the New Year . Inari is one of the most well known kami in popular folk Shinto. He (or she) is the god of rice and is related with general prosperity. In earlier Japan, Inari was also the patron of sword smiths and merchants. Primarily, however, Inari is associated with agriculture, protecting rice fields and giving the farmers an abundant harvest every year. One of the main myths concerning Inari tells of this kami coming down a mountain every spring when it is planting season and ascending back up the mountain after the harvest for the winter. Both events are celebrated in popular folk festivals.
. Myoobu Kitsune 命婦狐 Myobu fox court lady of the Heian period . She always appears riding on white fox.
. Dakiniten (Vajra Dakini) 荼枳尼天 . In Japanese, a fox's bark is written, "Kitsu! Kitsu!" This myth comes from a folk etymology of the word "kitsune," in which "kitsu" is onomatopoeia for a fox's bark and "ne" means "sound." Therefore, a fox is something which makes the noise "kitsu." Whether this derivation of the word is true or not, it's been a long, long time since Japanese foxes said "kitsu." Modern Japanese write the fox bark as "kon kon." In English, the official words for foxes are "bark" and "yelp". The fox is an indigenous, if not notorious creature in Japan. It is believed to have the power to bewitch or possess the spirit of anyone who looks into its eyes. The fox is also honored by business owners as a patron spirit animal. Stone images of foxes can be seen guarding almost every temple, great or small, in Japan. The golden bean curd omelet is called ABUR AGE (pronounced Ah-boo-rah-gay) and is often placed upon the altars of the temples as an offering to the gods who reside there. My suggestion is to translate 'kon' as "yip:"
'kon kon kon' = "yip yip yip"
... More in the WIKIPEDIA !
. gankake torii 願掛け鳥居 miniature gate to make a wish .
. Sen Sotan Inari Jinja 宗旦稲荷神社 . The sacred ropes along the stone wall are renewed. At Fushimi Inari, Kyoto, on the Inari Yama 稲荷大山 mountain shrine. In the valley below Gozendani 御膳谷 thre used to be two halls for the deities to feast : Miae dono 御饗殿 and O-Kama dono 御竈殿. Food offerings were made on the sacred stone Mike ishi 御饌石 . Now on the sacred stone 神石 70 small sacred clay dishes 斎土器 (imi doki) are placed, filled with ritual white sake (中汲酒　nakakumi sake) and prayers for a good harvest are offered. 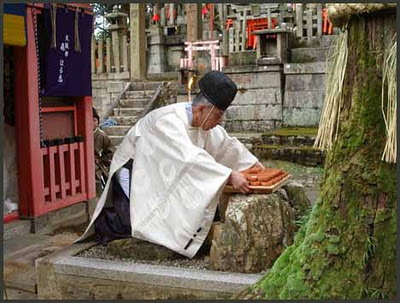 Priests wear special ropes made from local vines (hikage no kazura　日陰のかずら)　and a branch of sacred cedar. The sacred dishes were auspicious amulets and people could take them home. The fight for getting one of the dishes was part of the festival, some people even got hurt in the wrangling. The sacred dishes were a favorite of the local sake breweries, which took them as a sign for a good brewing season.
. Kawarake throwing at Mount Atago . At the Fushimi Fox God Shrine (Fushimi Inari) in Kyoto. To pray for good harvest and luck in the new year, arrows are shot in all directions to war off evel spririts and bad luck. Food. Cold rice wrapped in a sheet of tofu. ***** . WKD : Horse (uma　馬) . ”fox fire" at Oji Inari Shrine . The Fox and the Badger (tanuki) are well known in Japanese legend as tricksters.
. haru no yo ya kitsune no izanau ue warawa .
. kindachi ni kitsune baketari yoi no haru .
. kitsunebi ya dokuro ni ame no tamaru yo ni .
. kusa karete kitsune no hikyaku tori keri . Hikyakugitsune 飛脚狐 "the fast messenger "flying" fox"
He even has a Shrine in his honor. That makes no sense in a Western context. To us — at least traditionally — a fox is a rather sly and clever animal. In traditional Japan, however, a fox (kitsune) is a creature that lives between two worlds — ours and the “spirit” world. In Japan, foxes were believed to be able to take on human form, and woe to the young man who happened to become infatuated with a fox spirit! He would just fade and waste away like a shoot of grass withering, and would eventually die. Buson has reflected this notion in the withered grasses of the autumn fields in his hokku. He sees the fox hurrying past not as just an ordinary animal, but rather as a courier passing swiftly with a message to deliver, involved in his task and giving no attention to the human. Buson regards the foxes as living their own lives in their own eerie society, separate from that of humans, but occasionally coming in contact with them. This verse has a feeling that we in the West would associate with Halloween. It is far from the best kind of hokku, but it did exist, and it does have its effect.
. Basho Inari Jinja 芭蕉稲荷神社 .
. Handa Inari Shrine 半田稲荷神社　Tokyo .
. Inari 稲荷 the Fox Deity amulets . . The Inari Fox of Katsuyama ! The food is an offering left for the fox-- a powerful spirit that, if not placated, could possess people. your head, it seems . . . Written in 元禄6年, Basho age 50. Saitan-sai (歳旦祭): During the first three days of the New Year, more than 1,500,000 people visit the shrine to pray for their happiness and divine protection throughout the year. Ōyama-sai (大山祭): Rituals are held by offering Sake (Japanese liquor) on the Mike-ishi (sacred stone) of the Gozen-dani located in the middle of the mountain. Seventy earthenware vessels used for the ceremony are distributed among the brewers who wish to get them for their own brewing ceremony. 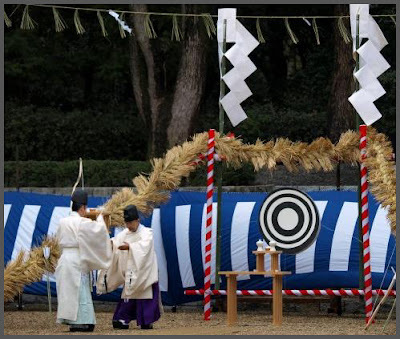 Housha-sai (奉射祭成年祭): This is an archery ceremony to drive the evils away to bring fortune and blessings upon oneself, and to pray for the prosperity of the people. Hatsuuma-taisai (初午大祭): On the first day of the “Hatsuuma” in February of the lunar calendar, the anniversary of the establishment of this shrine, the shrine is crowded with worshippers to commemorate the occasion and offer prayers. Inari-sai (稲荷祭): Annual festivals are held by the parishioners to express thanksgivings for their prosperity and five divine palanquins visit a sacred spot (Otabi-sho) in procession. One of the exciting developments that Green Shinto is able to participate in is the spread of Shinto overseas. Such is the age we live in that this is happening step by step before our very eyes, as it were, and recent months have seen the establishment of an International Association for Inari Faith with a Facebook page, together with what is probably the first ‘private’ maintenance by a non-Japanese overseas of a wakemitama (divided spirit) of Inari Okami. In the interview below, the person behind all this, Gary Cox, explains the nature and purpose of the new association. She is often depicted on a white fox, almost like Dakini. TAJIMI JONES exploring . . .
With kappa, tanuki and more mezurashi statues . . .
With these words, he vanished from sight. Therefore, Naomasu dedicated the great temple to him which still stands in the castle grounds, surrounded by one thousand foxes of stone. Tokugawa Naomasu (1601 - 1666), grandson of Tokugawa Ieyasu. Echizen Province (越前国, Echizen no kuni) was an old province of Japan, which is today the northern part of Fukui Prefecture. Don't believe in Yokai Wars? Kitsune Shrines are being attacked throughout Japan. kitsune no yome-iri, kitsune no yomeiri　狐の嫁入り "the fox taking a bride"
All the blacksmiths of the region come here to worship. Once a 三条の鍛冶師 blacksmith from Sanjo had a dream given to him by the 土祖神 local deity. If he would take the earth from Inariyama and mix it with the water for the blade (刃の湯) he would be able to make wonderful sword blades. When he did as told in his dream, indeed, his sword became quite famous as Kogitsunemaru 小狐丸. Now all the blacksmiths and 金物師 metal workers come here to worship. - - - - - 妖刀子狐丸 - legend about a serpent and a sword called 小狐丸 Kogitsunemaru. This story was told at the end of the Edo period. When the ancestors of the 安斎氏 Anzai family experienced a difficult birth, a fox appeared and died in front of their home. When they asked a shaman about the meaning of this, they were told that this fox was a messenger of the famous Fushimi Inari from Kyoto. The fox had carried the curse for a difficult birth. Therefore they erected a small sanctuary and held a memorial service for the fox. This is the 御仁稲荷 Gojin Inari. fox posing for a monk was named 多久蔵主 (たくぞうす) was Takuzosu. 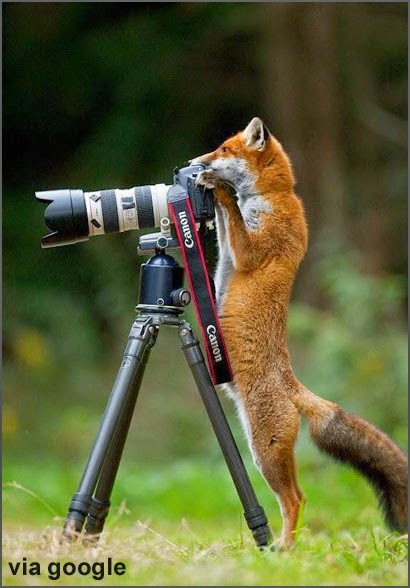 with many foxes in all kinds of positions ! Google for your fun ! The rock is dedicated to the Shinto deity Uganomitama 倉稲魂命 Ukano Mitama . In 1907, a bunke 分家 branch family split from the main family. The Inari deity from the main family followed them and they built a yashiki inari 屋敷神稲荷 small shrine in the compound to venerate it. Since then they never had a fire, thanks to the Inari. The maid of a certain family once went for an errand as usual but did not come back. When they searched for her, they found her crouching at the Shrine for Tomisaka Inari. She had been bewitched by a fox and even her facial expression had changed. She begun to eat a lot and soon lost her senses. This also happened to another maid servant and then even to the daughter of the family. Eventually the family was extinguished and the only daughter left had a hard life herself. She had some exorcist rites done and eventually was healed. The Shrine was founded in 1951 to become a place of worship for the many new residents in the nearby Tower Mansion (Tawaman) district. It should give the residents a place to come and talk and make friends.